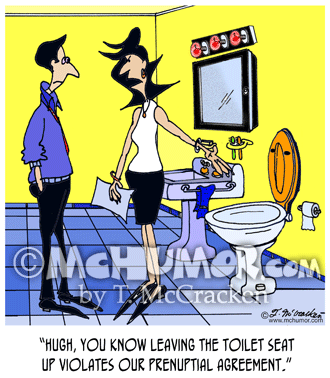 Prenup Cartoon 7855: A woman in a bathroom saying to a man, "Hugh, you know leaving the toilet seat up violates our prenuptial agreement." 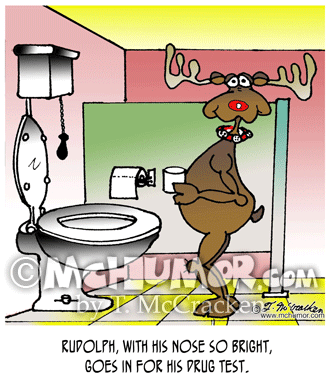 Christmas Cartoon 4594: “Rudolph, with his nose so bright, goes in for his drug test.” A reindeer with a cup stands in a bathroom. 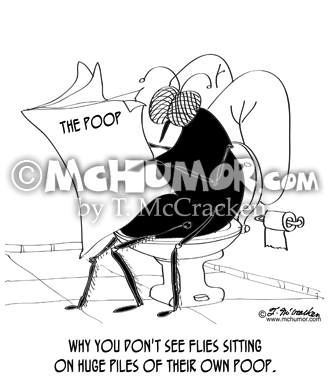 Toilet Cartoon 9263: "Why you don't see flies sitting on huge piles of their own poop." 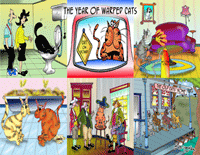 A fly sits on a toilet reading a newspaper, The Poop. 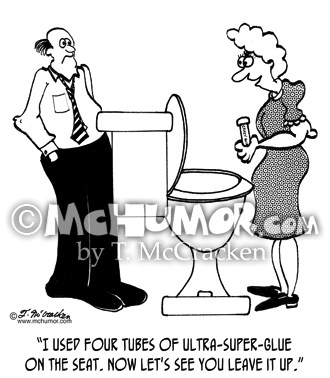 Toilet Cartoon 2810: A woman in front of a toilet says to a man, "I used four tubes of ultra-super-glue on the seat. 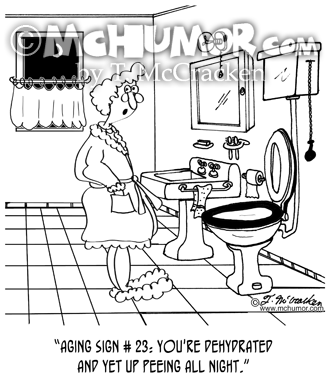 Now let's see you leave it up." 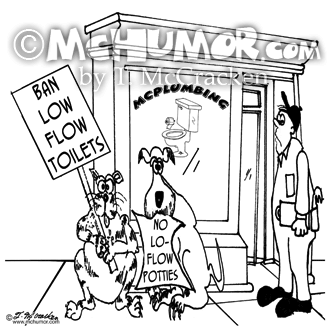 Dog Cartoon 7536: Outside of a plumber's office a cat and dog protest against Low Flow Toilets. Baby Cartoon 5616: A baby making a mess in a bathroom. 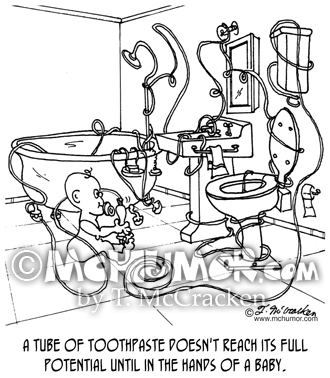 "A tube of toothpaste doesn't reach its full potential until in the hands of a baby." Kid Cartoon 0496: As kids in the car scream, "Dad! when are we going to be there!?!" and "Mom! I need to go to the bathroom!!!" 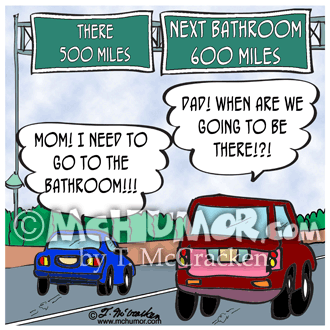 they pass a sign that says, "There, 500 Miles, Next Bathroom 600 Miles." 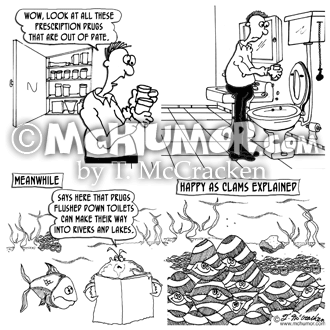 Water Cartoon 8267: A) A man looking in a medicine cabinet in his bathroom says, "Wow, look at all these prescription drugs that are out of date." 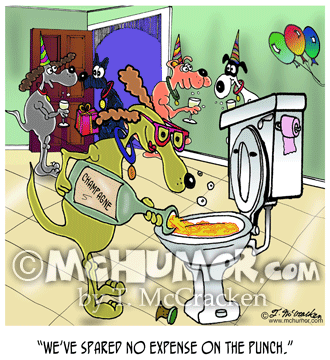 B) He flushes them down the toilet." C) "Meanwhile." A crab reading a newspaper in a lake says to a fish, "Says here that drugs flushed down toilets can make their way into rivers and lakes." D) “Happy as clams explained."